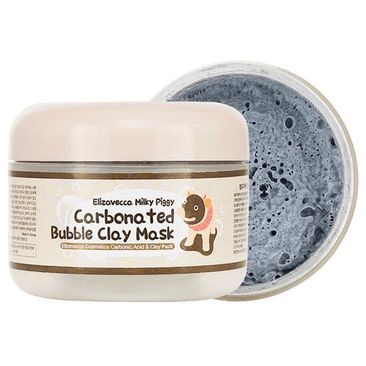 Carbonated Bubble Clay Mask - By Elizavecca Milky Piggy! PRICE: C$18.99 / See at Walmart.ca. INGREDIENTS: Grean tea, pomegranate, charcoal powder, aloe vera leaf, witch hazel, alantoin etc. Formulated with carbonated water and mud, washes off pores and dirt on your face. Contains various vegetable ingredients such as Green Tea, Pomegranate and Charcoal Powder Extract. A adsorptive power of Charcoal and mud removes excessive sebum. Clay mud and charcoal powder removes makeup dirt and tightens pores at the same time. Moisturizing your skin afterward is recommended. The carbonated bubbles gently massage the pores. After paste mask to your skin for 5 minutes, bubbles are generated, add some water to skin and massages two more minutes, effect of cleansing is maximized. This product is a direct import to us from the manufacturer in KOREA - "ELIZAVECCA" and has arrived with the label in KOREAN. Translated label information is included in both the English & French languages for the Canadian retail market. We have translated the label information for Canadian use into English and French. This same item sells at Walmart.ca for C$21.99 each - available only online with the label in Korean. Where ever you buy this product it will be labelled in Korean. We have translated this product into English and French - as a Canadian law requirement. Many people who suffer from facial blemishes want to find the best method to encourage speedy healing, yet not have to pay for an expensive prescription medication. The carbonated bubble clay mask was created to provide healing benefits to people who suffer from acne and blackheads. The carbonated bubble clay mask is similar to your regular mud mask but better. It contains thousands of carbonated bubbles, much like soda pop does, and that provides gentle massaging properties to the pores. These cleansing properties help to lift out oil and dirt from deep inside the pores. When you’re able to encourage your pores to stay clean and clear, they will not inflame and result in unsightly pimples, blackheads, or white heads. Elizavecca Milky Piggy is the popular brand for this type of mask. This product comes in a white plastic 100 gram jar with twist cap and a cute label. It contains natural ingredients that have been tested for efficacy. It’s easy to use and only requires a minimum investment of time in the bathroom. Both its name and the healing bubble action ensure that this beauty treatment is fun and relaxing. With a quick Google search you’ll see many bubble face masks pop up, however, there is really only one bubble clay mask. The other masks are not clay masks, they utilize more of a lotion formula that is more suitable for those seeking a moisturizing experience. If you’re wondering if a carbonated bubble clay mask may be good for your skin, it’s best suited for people who suffer from extremely oily skin, acne, and blackheads. It may not be suitable if you have normally clear and dry skin, though many people enjoy how the bubble clay mask makes their skin feel clean and refreshed. It’s best to make the differentiation between the two bubble mask types to ensure that you choose the correct one for your skin type. Right now, Elizavecca is the best choice for a bubble clay mask, and likely the only choice on the market today. If you do see any competitors, it’s best to stick with the first and best brand. Both men and women can try the carbonated bubble mask to experience its benefits. It provides a gentler solution than exfoliating with a loofa or an abrasive sugar scrub. Instead, the bubbles work to scrub out your pores gently, removing oil, makeup, and dirt. If you follow the instructions, including length of time on your face, you’ll find that this is a much safer way to cleanse your pores. While there may be some reactions in a minor portion of consumers who try it, the potential for redness is considerably decreased over using an abrasive scrub. Helps to control excess sebum which aids in future prevention of clogged pores. Using the clay mask is also refreshing. You can use it first thing in the morning to help you wake up. Many people who use it will also find that their mood improves, because it provides a fun tingling sensation. After you have used your facial mask, your skin will look clean and have a youthful glow. This is because of its powerful nutrients that will soften and smooth your skin. The Milky Piggy mask is a worldwide best seller. It’s made in South Korea and the jar measures three inches by three inches and 2.4 inches tall. Both men and women can benefit from using this product. The clay mask has a pleasant aqua-themed scent that masks the smell of the clay. The texture of the mask has that same sticky, clammy texture that a regular mud mask has. But this clay mask differs from other mud masks that are designed to completely dry on your face before being washed off. This mask remains sticky on your skin until you wash it off. There are many ingredients contained within the carbonated bubble clay mask. Charcoal powder, green tea, pomegranate extracts, and collagen all work together to benefit your skin. There are some natural ingredients in these products, and a few standard chemical products that you find in most skin care products that are designed to preserve and provide the texture to the product. It’s simply to use a carbonated bubble clay mask. While it’s not necessary to wash your face first, you should ensure that you do wash your hands. You can use the mask day or night, it doesn’t matter. You don’t have to wash your face in advance to use the mask, as you’ll be rinsing your face off after you do use it. Many women choose to use the carbonated mask as a makeup remover. However, you can also use it in the last step of your skin cleansing program if you wish. If you wear long-lasting permanent makeup, you may wish to remove your makeup first, as the clay mask may not have enough cleansing power to remove it. The Milky Piggy comes with an included spatula. All you have to do is use the spatula to remove a small amount from the jar. You can use this to scoop out about a half a tablespoon of the clay product. This also keeps the quality pure. You can use the spatula to spread it over your face, or your fingertips. Gently tap it on the skin of your face, avoiding nostrils, eyes, lips, and hairline. You should be aware that the product does foam up so you may wish to place a smaller amount on your face than you would normally for a clay mask. You don’t want to overdo it then have to worry that the clay may drip off. Ensure that it’s evenly spread on your face. You don’t want to leave any large blobs as these may fall off and leave you wasting product. Once the mask has been applied to your face, the carbonation inside the mask will cause it to froth up. It begins to froth up as it oxidizes with the air. This process will take about three to five minutes. You’ll soon see how the gooey wet clay will start bubbling up, and become frothy, foamy bubbles. You’ll notice how the foam has a lighter colour than the actual clay mask product. Many people like to watch this happen in a mirror. You will also experience a gentle tingling feeling on your skin. If you wish to provide additional benefits to your skin you can also use your fingertips to gently massage the clay around your face. You can do this for about one or two minutes. Next, apply some water to your face and continue to massage lightly. This will also help to remove the mask from your face once you’re done. This type of clay mask differs from other types of clay masks in that it doesn’t dry out. Don’t bother waiting, or you’ll be waiting for a long time. After the mask has stopped foaming, or about ten minutes, you’ll now be ready to use a clean damp washcloth to wipe it off your face. Use only lukewarm water. Pat your face dry and you’ll see for yourself how your face is so clean and refreshed! Ideally, you should leave your face free of cosmetics, but if you must apply, wait an hour or two to do so, perhaps in the washroom at work. You should use your clay mask only two or three times a week. The consumer reviews for the Elizavecca clay mask are favourable, with about 4.5 out of 5 stars. Many people with sensitive skin find that this product is gentle enough for their skin. Also, people with differing skin types like using it, even if they don’t have acne. Many people will get compliments on how their skin glows. Many consumers note how soft their skin feels after using it. Consumers also enjoy how much fun it is to use, rather than your basic mud mask. Many couples enjoy using it together, to have an enjoyable spa experience at home. Often any disappointment has been related to its usage. For people on the lower end of the scale, they have commented that they found the clay mask was difficult to remove from their skin afterwards. This can be counteracted by adding warm water to the face and further massage, and the use of a clean damp facecloth. They may also have left the mask on their face for too long, even though directions say to only use it for up to ten minutes. Some people also attempted to use the clay mask at their dressing table rather than over the sink, which can be messy. It’s important to read directions and instructions so you can experience the positive benefits of using the clay mask. While this carbonated skin mask is safe for most facial skin types—normal, dry, oily or combo skin—it’s still important to be aware that if your skin becomes intensely red or covered in hives after usage, to discontinue its use. If you have extra sensitive skin you may wish to test a drop of mask on the inside of your wrist first. Be sure to use the included spatula, so that you don’t introduce any foreign matter to the mask that could affect its quality. Don’t use your fingers to scoop the mask out of the jar, as that could cause it to prematurely bubble up. Wash the spatula off before placing it back in the container. It’s also important to store the jar in a dark cupboard. Since the clay mask activates and froths when exposed to air, you don’t want to leave the lid off. After you have scooped out enough onto the spatula and applied to your face, you should immediately screw the cap back on tightly. You can always continue spreading the clay over your face after the lid is back on. Remember to always ensure the lid is in place so that your clay mask doesn’t prematurely dry out. You’ll also want to store it away from heat or sunlight to prevent the same from happening. To avoid mess, use your clay mask over a sink in the bathroom. Stay in place as your clay mask bubbles, to avoid having to clean the floor afterwards. Once you’re finished, the clay mask will rinse out from your sink easily enough. When you first receive your Elizavecca Milky Piggy Carbonated Bubble Clay Mask you’ll want to give it a try immediately. You may also notice how other family members will also want to give it a try too, so it may be best to order an extra jar or two so you don’t run out. Once you try the carbonated bubble clay mask you won’t want to go back to your usual clay mask again. Use it for the recommended three times a week and soon your face will have an even skin tone free of blemishes. Your friends and family will soon be complimenting you on how your face glows, and you didn’t even have to spend a lot of money accomplishing this effect! MILKY BUBBLE MASK REVIEW....Check this out!